I’ve been meditating in various forms since my teenage years, albeit with many on and off periods. Lately, I seem to have found a style that suits me very well, and I’ll be sharing some background on that today. Essentially, I’ll be describing zazen meditation. Zazen is primarily a seated type of meditation. There are several types of meditation, including ones that involve walking or even lying down. Zazen is considered the heart of Japanese Soto Zen Buddhist practice. The aim of zazen is that of suspending all judgmental thinking and letting words, ideas, images and thoughts pass by without getting involved in them. Of course, all this is done while being immersed in sitting meditation. In Zen temples and monasteries, practitioners traditionally sit zazen as a group in a meditation hall, usually referred to as the zendo. 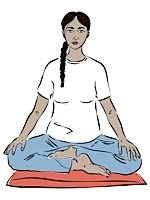 The practitioner sits on a cushion called a zafu, which itself is usually placed on top of a low, flat mat called a zabuton. Before taking one’s seat, and after rising at the end of the period of zazen, a Zen practitioner performs a gassho bow to their seat, and a second bow to fellow practitioners. The beginning of a period of zazen is traditionally announced by ringing a bell three times (shijosho), and the end of a round by ringing the bell either once (houzensho). If you go to a zazen meditation center you will most likely take part in a longer session that will be punctuated by breaks of walking meditation, so you will hear the bell sequence I just described. There is no need to use music while practising zazen meditation. It’s not common to have any background music at the zendo. At home, you are free to use whatever works for you. This practice might seem difficult, but daily practice is very effective in increasing your sense of self-awareness and intuition. While the practice of zazen typically awakens a certain energy and sense of wakefulness in us, there is no need to set any objectives or aims to achieve anything. It simply consists of concentrating on the posture and the breathing as well as the mind and the thoughts it gives rise to. You will need a zafu and zabuton, as we already mentioned. These can easily be found on Amazon. Here’s a picture of the Calming Breath set I got; I’m very happy with them. The zafu also doubles as a foot rest while working, which is great. Sit on the zafu (cushion) cross legged, with the zabuton beneath you for comfort. 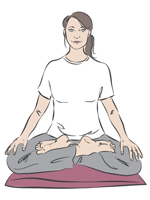 If you can sit in Full Lotus without serious pain, then it is by far the most stable of all the cross-legged postures. Place one foot on top of the opposite thigh then lift your other foot up onto its opposite thigh. The soles of your feet should be facing slightly upward and outward. If you experience pain, try going back to one of the easier postures while you continue to work on your mobility for this pose. 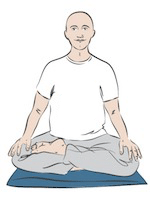 Many people who cannot manage Full Lotus can sit quite comfortably in Half Lotus. Place one foot on top of the opposite thigh. Your other foot should be resting on the floor just under the opposite thigh/knee. Try it both ways. You may find that one side is considerably easier than the other. If that’s the case, then consider some yoga stretches to work on the imbalance so that eventually you can alternate sides and work on Full Lotus. The Burmese Pose is ideal for those who aren’t flexible enough to comfortably stay in the Lotus poses. For this reason, it’s currently my preferred pose for meditation. Put the sole of one foot against the inside of the opposite thigh. Put the sole of the other foot against the shin of the opposite leg. All of both your legs and feet should be in contact with the floor. It’s not an easy position but does offer a really stable platform for those that can manage it. The weight of the body is placed on three points: the knees pushing against the ground and the perennial muscle which presses against the zafu. The spine is straight and vertical. The back is flexed, and the shoulders are relaxed. The chin is tucked in, the back of the neck is stretched. Push the top of your head up towards the sky. The mouth is closed and the tongue touches the upper palate and the inside of the two front teeth. This calms “interior chatting”. The eyes are half-closed and look down towards the ground, about one meter in front, without focusing on anything in particular. The rhythm of the breath is very important in zazen meditation. Breathe calmly through the nose, remaining totally conscious of it, meaning being attentive to each breath, like a tiger on the watch. Breathe naturally and breathe out calm, long, deep breaths all the way under the navel. Don’t judge your breathing – if it’s slow or rapid – it is just the way it is. Little by little, with practice, breathing out becomes soft, slow, peaceful, long and deep; pushing the abdominal mass downwards and creating a concentration of energy in the zone which is called the kikai tanden (ocean of energy) located under the navel. At the end of the breath, breathing in is done naturally. Once you have the right posture and the breathing rhythm in place, you can start noticing your state of mind. In the first practices of zazen you will most likely get distracted easily, and you will have many thoughts going on. Once you settle into the practice, however, you will notice that you start to take control over your mind and you start to adopt a stronger, more centered state of mind. At the end of the day, Zen is very simple, but at the same time very hard to comprehend. It’s a question of struggling and practicing repeatedly, much like life itself. In this seated position of zazen, without doing anything special and expecting nothing in return, if our posture, our breathing, and our mental attitude are in harmony, we will begin to understand the authentic Zen. If you don’t feel comfortable with zazen, I would recommend that you adopt the pose itself and use a more mainstream kind of meditation. You can use apps like Calm or Headspace for example, which are excellent introductions to the practice of meditation. Whenever I want to do a quick meditation I still revert to Calm. For example, at times when I don’t have time to do a full zazen meditation session, I’ll just pop in my noise canceling earphones and use Calm to do a 15-minute meditation. You don’t even need a mat for that, you can do it sitting down anywhere. do you practice zazen with someone here in Malta? I am looking for a group that is why I am asking. No Karl, I practice it in Spain. Let me know if you find anyone doing it in Malta, would be interesting to know.